4. Working class defense organizations must fight against the continuous gravitational pull of the non-profit system in the US, where money and resources flow to groups and projects that accept the limits of reformism. An anarchist and revolutionary program must reject this model; we can’t build effective revolutionary and working class solutions if we are funded by the bosses and government and are organized in ways that replicate their hierarchy. Non-profits can sometimes employ direct action and other militant tactics, pushing up against the boundaries of business and government. Thus they can present their work as progressive and even radical. But the central logic of non-profits is that they are, in the end, the loyal opposition within the framework of capitalism and the state, committed to reform but not to revolution. 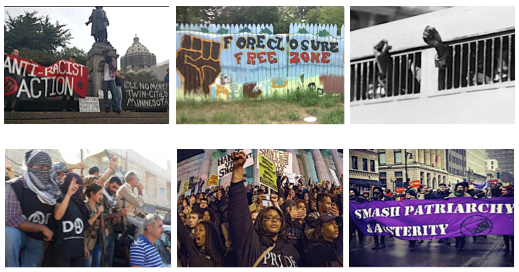 Whether they are partisan or politically independent, non-profits tied to “movement organizing” serve to contain and re-direct momentum from broader social struggles. They create deceptive alliances that obscure class contradictions and the actual antagonistic relationships between Power and the grassroots. The bureaucracy of the mainstream unions and civil rights groups play a similar role. A central aspect of First of May’s politics is that anarchist militants must be partisans of the working classes and oppressed, working within the class as equals on the grassroots level. Thinking of non-profits as vehicles for insurgent and revolutionary class and social struggle is a political dead end. We need to raise this objection clearly within our mass work. Our starting point in both our perspective and in our current work is the importance of organizing for the social self-defense of the working-class and oppressed communities . . .